For more than half a decade, we’ve bought our fish from Pietro Parravano, who docks his boat, the F/V Anne, near Half Moon Bay, and who sells his catch only at farmers markets. He’s an extraordinary man, active in environmental politics and sustainable fishing for decades. He’s smart, articulate, and kind; he has a sense of humor and a sense of wonder; he can tell you how to cook whatever he’s selling that week and he will remember to show my kids his live crabs, or ask about Ella and Finn on the days they stay home. 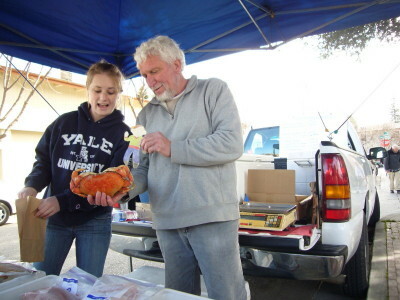 He’s taught me a lot about fish and sustainability, and our table and market would not be the same without him. Many nights all I’ve had to say to Ella and Finn to get them to eat a new fish dish is, “Pietro caught this fish for you,” and they dig in. And his fish is extraordinary. Fresh and local (with a few exceptions in the past year, including Gulf Prawns and scallops, brought on in large part to combat the closing of the salmon fishery), it’s worlds better than anything you can buy anywhere else. I’ve tried. You might get a wider selection at a larger store like Whole Foods, but it’s just not as good. There’s no comparison, really. Of course, all Pietro’s fish is seasonal, but over the course of the year he has a good range on on offer, including: crab, salmon, albacore tuna, halibut, sand dabs, ling cod, petrale sole, red snapper, scallops, prawns, (cleaned) calamari, and a range of smoked fish that will blow your mind: lox, smoked salmon & salmon fins, albacore, etc. The smoked fish is so good–smoky and salty and sweet–we have to sit down with the kids as soon as it’s on the table or we don’t get any. Some of the fish, of course, can be expensive–like the salmon or halibut, and prohibitive for a regular family to eat every week. But it’s worth every penny when we do get it. We can always afford red snapper, though which is affordable and satisfying and delicious. 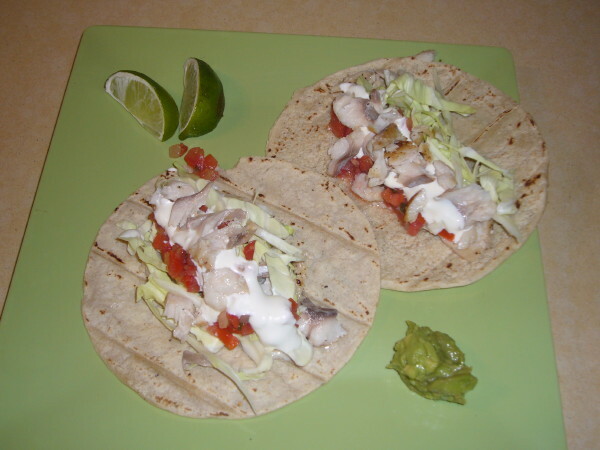 We broil or pan fry it–with fish this fresh you don’ t have to do a lot to it–but lately we’ve been eating a lot of fish tacos, which have become one of Ella and Finn’s favorite meals. And this is one of the ways that their childhood is light years from mine. I didn’t even know what a fish taco was until I was in graduate school, here in California, and even then, it took years to convince me that they were something worth eating. Now, I lament all the years I lost not eating fish tacos. Both my husband and kids still laugh at me for it. But I’ve made up for lost time and to please my fish taco loving family. I would agree that the best fish tacos are the classic ones, built on a fried white fish, and we do this sometimes. But really, frying can be rough on weeknights (the flour, the hot oil, the dredging and clean up). So I improvise by broiling or grilling the fish and using as many good-quality pre-made sides as I can, and our table is not much poorer. Also, since we have most of the fixings all of the time, this is a meal I can pull together in a matter of minutes. It’s a Monday night standard, since we buy our fish on Sunday, and we like it to be very fresh. The kids craft their own tacos. And I say craft because they take very great pride in making theirs exactly the way they like. It’s satisfying, really fast, really fresh, and really healthy. These of course, were made by The Husband. But they give you an idea of what one can aspire to. If you’ve been in an aquarium anywhere in the last five years, you probalby know something about sustainable fishing. More information on clean (though not necessarily local) fish here and here. I’m drooling…yummo! I can’t wait to meet this fisherman of yours and make some fish tacos for my guys. Thank you so much, Lisa.